Endless Mountains Heritage Region director Annette Schultz (top, right) addresses those gathered along the Merrill Parkway and River Walk in Towanda on Wednesday for the official unveiling of a new sign and map of Bradford County. Participants included (top, from left) Bradford County commissioner Daryl Miller, designer Diane Terrell, commissioners secretary Michelle Shedden and commissioner Ed Bustin, seen above taking a photo of the sign. The first of two signs installed in county seats recently through a collaboration of the Endless Mountains Heritage Region (EMHR) and the Pennsylvania Department of Conservation and Natural Resources (DCNR) was unveiled in Towanda on Wednesday. 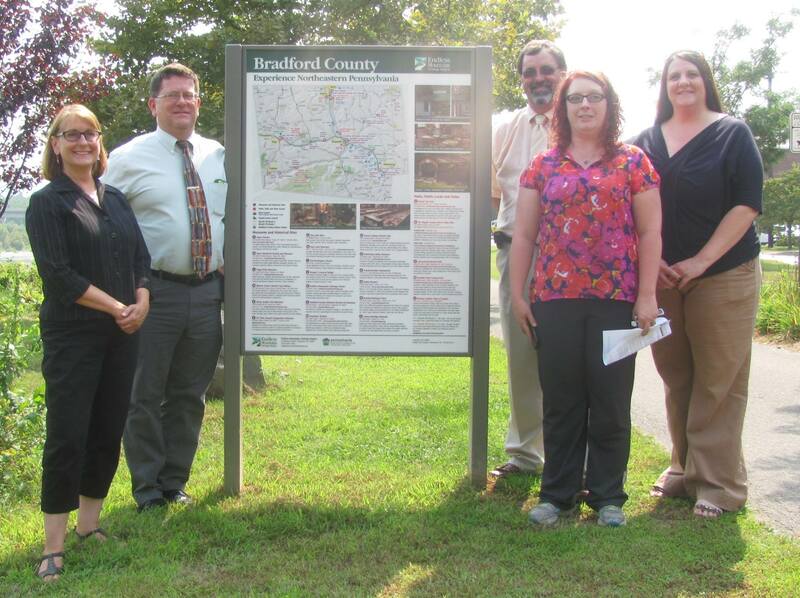 The sign and its map were hailed by public officials as great achievements and much-needed tools for showing local residents and visitors alike how much there is to do in Bradford County. 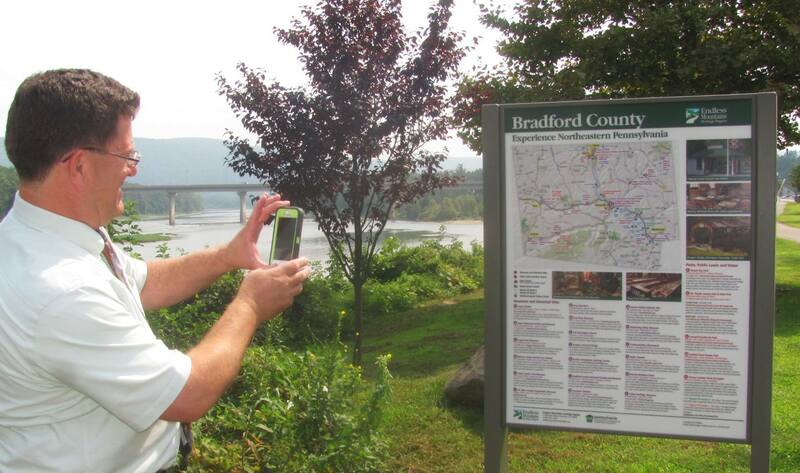 More than two dozen museums, historical sites, parks, public lands, and vistas throughout Bradford County are featured on the sign, with river access points and biking trails also clearly marked on the detailed map. Descriptions matching numerical and alphabetical bullet points on the map are provided, as well as addresses, phone numbers and websites, enabling a Smartphone or e-tablet user to quickly access more information and driving directions. Projects such as this demonstrate EMHR’s commitment to preserving and promoting local cultural and historic sites while keeping an eye on the future of heritage resources, EMHR director Annette Schultz explained to those in attendance. Robyn Chamberlain, director of the newly formed Bradford County Tourism Promotion Agency (BCTPA) and Jennie Marino, director of the Central Bradford County Chamber of Commerce were also on hand for the unveiling of the sign and concurred that it was a great step toward tying together the county’s numerous heritage assets. 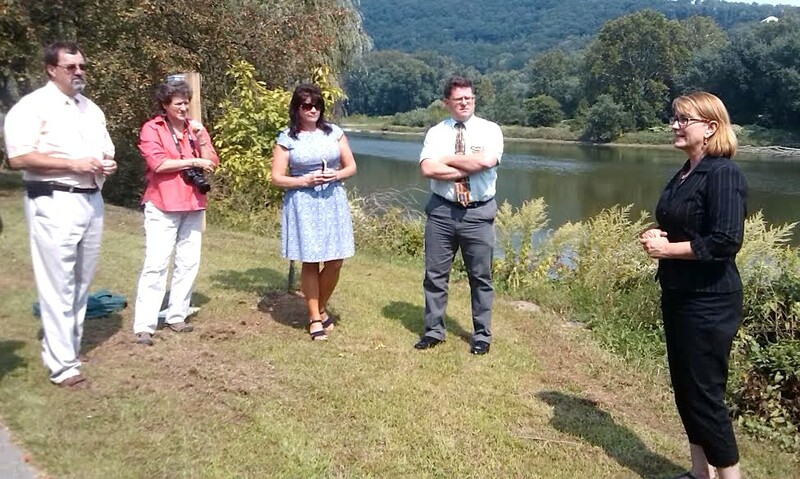 Christine Dettore, a regional DCNR advisor was also in attendance, as were several EMHR board members and employees. Traditionally, the Endless Mountains Visitors Bureau (EMVB) worked hand-in-hand with EMHR as the agency that promoted the venues that EMHR supports through grant acquisition and networking opportunities. Bradford County broke away from EMVB in 2014 and formed the BCTPA earlier this year. Chamberlain stated that she is looking forward to working closely with EMHR and Schultz, who became EMHR’s director in June. Schultz noted that the signs in both Bradford and Wyoming counties, which were designed by Diane Turrell of DH Design in Tunkhannock, can be easily replicated, and Schultz would like to see others installed throughout the county. They can also be printed as banners for use at public events or indoor displays. EMHR plans to install similar signs with maps in Sullivan and Susquehanna counties as funds become available. Participating in Wednesday’s unveiling of the Bradford County version of new Explore Northeastern Pennsylvania signs were (from left) EMHR director Annette Schultz, Bradford County commissioners Ed Bustin and Daryl Miller, Central Bradford Chamber of Commerce director Jenny Marino, and Bradford County Tourism Promotion Agency director Robyn Chamberlain.